Connecticut is home to a large Italian American population. In fact, Connecticut is home to one of the largest populations of Italian Americans in the country, at 20 percent of its population. So it should come as no surprise then that Connecticut is home to some truly amazing pasta dishes. Think of mouthwatering lasagna, a steaming plate of spaghetti and meatballs, or a bowl of juicy seafood pasta on a hot summer’s day: all of these dishes and more can be found at Connecticut’s 10 best spots for pasta. What will you order? Paul’s Pasta produces all of its pastas fresh daily in-house, and these pastas accompany flavorful sauces, seafood, meats, cheeses, and vegetables to produce memorable dishes. Their chicken with fettuccini alfredo is definitely a top choice, as is their spaghetti pie. Paul’s Pasta also offers half portions, which is great if you are dining with children or looking to eat a smaller portion. If you’re hosting a dinner party, Paul’s Pasta is a great resource, as you can purchase their freshly made pastas and sauces to serve at home. L’Orcio is an Italian restaurant that maintains its traditional roots by serving pasta dishes that you’d expect to see on the menu at many restaurants in Italy. Expect to find incredibly fresh pappardelle al ragu, made with a special homemade meat sauce, tortelli alla Mugellana, and the simple pappardelle al pomodoro. Another delicious dish is their handmade tortelli di zucca, which is ravioli filled with handmade butternut squash mousse topped with a buttery sauce and Pecorino cheese. Aranci 67 offers five different pasta dishes on the regular including some spectacularly flavorful homemade dishes. Dig into their cannelloni al forno, which is cannelloni filled with cheese and beef and baked in a tomato sauce, or linguine ai frutti di mare—a perfect dish for seafood lovers. Every Tuesday through Thursday from 5 p.m. until 10 p.m., Aranci 67 offers an economical prix fixe menu that has a great selection of pasta dishes that will tempt any Italian food lover. Café Silvium is a classic Italian trattoria that offers both great food and an extensive wine selection. From antipasti through to the secondi, you’re in for a treat dining at Café Silvium. 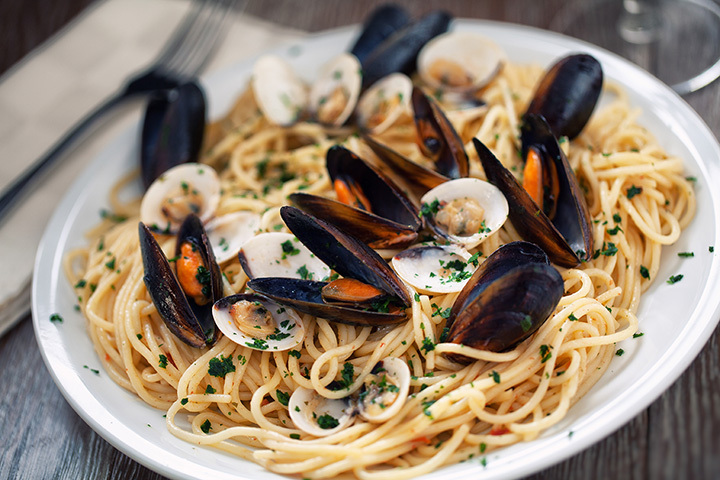 Pasta dishes include fettuccine al mascarpone, cappellini alle vongole, orecchiette della massaia, and lobster ravioli. Enjoy flavors found throughout Italy with a meal at Treva Restaurant. Travel to southern Italy with orecchiette with pesto sauce that bring flavors from Puglia. Or, opt for cacio e pepe, a Roman dish incorporating pecorino cheese and black pepper. Pair your meal with a bottle of wine and a gorgeous antipasti of zucchini blossoms or Sicilian arancini. Savor Italian dishes in a contemporary, romantic setting that features hand painted murals and a Tuscan ambiance. Pasta lovers will definitely want to stop by Salute Restaurant for dinner, as the menu features 12 different pasta dishes. Chicken parmesan is definitely a favorite of many, with its breaded chicken, marinara sauce, and fresh mozzarella. Other favorites are pasta ala vodka, veal piccata, and rose pasta. Rebeka Fresh Pasta Restaurant is a locally owned and operated restaurant that specializes in freshly made Italian pasta. On their menu, you’ll find spaghetti pomodoro, rigatoni with meatballs, spaghetti alla carbonara, and more. Several of their mains can also be served with pasta on the side, allowing you to taste their delicious entrees and pasta in the same dish. Flavorful dishes await at Viron Rondo Osteria, with heartwarming pasta dishes such as fettucine carbonara, penne al forno, and lasagna. In addition, all pasta dishes on the menu can be made gluten-free. Other menu items include pizza, salads, and main courses, with numerous seafood and meat dishes available. Established in 1938, Carbone’s Ristorante has been serving classic Italian favorites in an elegant atmosphere. The chefs at Carbone’s incorporate locally sourced ingredients to create flavorful pasta dishes such as creamy carbonara, pasta al Bolognese, and shrimp scampi. Specials frequently grace the menu, so this is one restaurant you’ll want to visit more than once to test out the different dishes. Café Mangia’s seasonal menus are packed with Italian favorites to be enjoyed in their cozy restaurant warmed by a fireplace or outdoors on their beautiful patio. Wherever you choose to dine, Café Mangia’s menu favorites include basil pesto rigatoni, penne alla vodka, and rigatoni alla primavera. Their grilled polenta cakes are also very delicious and definitely worth the visit.